Can't Play DVD on Windows 10? Download the DVD Codec to Have a Try! Due to the removal of Windows Media Center from Windows 10, many people lose the DVD playback option. So, how to fix the issue that Windows Media Player can't play DVD in Windows 10? Microsoft suggests users to install Windows DVD Player app to revive DVD playback capability. However, this tool is available free for a limited time for users upgrading to Windows 10 from Windows 7 Home Premium, Windows 7 Professional, Windows 7 Ultimate, Windows 8, or Windows 8.1 with Windows Media Center. If you don't meet the criteria or did a clean installation, you have to pay $14.99 for it. And worse still, you may also experience "Can't decode DVD" error on Windows 10 DVD Player. But luckily, there are many third-party free media players compatible with Windows 10. With DVD codecs built in, they can play DVDs on Windows 10. 5KPlayer – A powerful Windows 10 media player that can play all DVDs (incl. those encrypted by all copy protection schemes/region codes) on Windows 10 without requiring additional DVD codecs. 100% free & clean. In order to play DVD on Windows 10, firstly you need to have the right DVD codecs installed. A codec is a piece of software which allows applications to read a video or audio format. Generally speaking, playing DVDs requires MPEG-2 video compression and Dolby Digital (AC-3) audio. This is because MPEG-2 codec is commonly used on standard commercial DVDs and Dolby Digital is the widely used audio standard for DVD. Other DVD codecs include: MP3, WMV, DivX, Xvid, etc. If DVD not playing on Windows 10 PC since the player (like VLC) doesn't have right DVD codecd, don't despair. Just download the DVD codec for Windows 10 online. Some are paid, but free DVD codec packs can also be found. And Media Player Codec Pack is a popular choice. It is free, and compatible with Windows 10 32-bit and 64-bit, covering almost all codecs needed to play DVDs, videos and audios. Free download the DVD codec pack to Windows 10 from its official site or a third-party software download site. However, most people would rather use a Windows 10 media player coming with all DVD codecs than spend so much time and energy installing additional DVD codecs to an imperfect player. The most common media player may not be the most powerful one. Your Windows 10 player can't recognize the DVD codec you throw to it? Don't waste time to search and install DVD codec pack. The simplest way is to download a new player built with all DVD codecs, for example 5KPlayer. 1. 5KPlayer is totally free and clean. 2. It comes with all DVD codecs including MPEG2 to play all home-made and commercial DVDs on Windows 10 and previous operating systems. 3. Besides playing DVD discs, it also supports ISO file/DVD folder playback natively. 4. What's more, it also has all video audio codecs to play video audio files. 5. 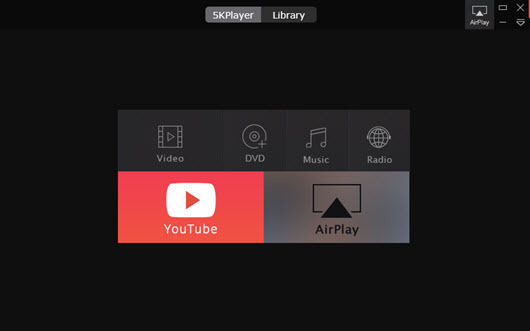 Apart from acting as video/audio/DVD player for Windows 10/8.1/8/7, it is also a radio player, an Airplay receiver/sender, and an online downloader supporting 300+ sites. If you don't want to download DVD codecs to Windows 10, and are reluctant to download another player, well, there's a third option – decode DVD to a digital file compatible with your current player. To decode a DVD, you need a DVD converter. Here, let's take the popular WinX DVD Ripper Platinum as an example. This tool can not only decode home-made DVDs, but also derypt copy-protected DVDs to mainstream formats like MP4, AVI, WMV, MOV, FLV, MPEG2 as well as prevailing devices like iPhone, iPad, Android Samsung, HTC, Sony and Microsoft gadget. After downloading and installing on Windows 10, you can decode a DVD within 4 steps only. Step 1. Load target DVD by clicking "DVD Disc" button. Step 2. Decide which output profile you want to decode the DVD to, for instance, MP4. Step 3. Specify a destination folder to save the file converted from DVD. Step 4. Tap "RUN" to begin decoding DVD to a digital copy.